The tempo is fairly slow, with Carlos keeping to the speed limit throughout the song. Carlos Santana has leapt back into the public imagination, his blend of Latin and rock styles dovetailing neatly with the current fascination with salsa-style music. Well, no one’s complaining, Carlos has been an influence on guitarists for the 30 years or so and it’s about time he had the gongs to show for it. For this track, we go back to the heady days of 1970, when rock guitar was busy being born fresh from the loins of the 60s blues boom. It’s difficult to imagine now, but in those days the sound of a sustaining Les Paul was a complete novelty. Amp technology was leaping forward thanks to the demands of players like Clapton, Hendrix, Townshend and co and 100-watt heads with 4×12 cabs were very much in favour. When Carlos came along, he brought with him more ingredients for the rock-guitar stew: South American rhythms and Latin percussion graced nearly every track and contrasted well with Santana’s melodic guitar style. The only other guitarist who had a similar flair for melody then was Peter Green, who had demonstrated it well with tracks like Albatross and The Supernatural. Samba Pa Ti was recorded during the sessions for Abraxas, Santana’s second album, the same album which gave us Black Magic Woman and ‘Oye Como Va’. On this particular track, Carlos keeps the throttle well within respectable reach of most people; there are virtually no licks which qualify as ‘fast’ – certainly by today’s standards. Scale-wise, we veer between mainly pentatonic and major varieties, so there’s nothing controversial there, either. The points of technique I would bring up concern the usual suspects of tuneful string bends and the odd unison bend, too. It’s critical that everything stays in tune in both these areas and so a little careful practice may be necessary to get things spot on. Ideally, you need a twin humbucker-equipped guitar for maximum authenticity and you don’t need too much gain on the amplifier, either. It’s a common mistake to assume that just because this particular knob on your amp goes all the way up to ten that you need to use it at full rotation at all times. If you check out the amp settings I used, you’ll see that I was using a gain setting on 12 -and the JMP-1 goes up to 20. What’s more, it was set on ‘0/D1′ (overdrive one), which is by far the more dainty of the Marshall’s two overdrive settings. So if your amp goes up to the standard 10, you might like to try setting the gain on 6 and seeing what happens. You’ll notice that I was also using the neck pick-up for a smoother, more rounded tone. A lot of twin humbucker guitar owners seem to forget that this pick-up exists, ignoring it in favour of its far more virulent partner down at the bridge. Shame! A lot of very good noises are to be found in association with this pick-up and I fully support the idea of you experimenting as much as you can. If you are a Strat or single-coil player, I’d definitely choose the neck pick-up, too, although you might have to increase the mid-range control on your amp to reinforce the sound a bit. Have fun with Samba Pa Ti and we’ll resume our excursion into the blues next time with something rather special. You can be also interested in Carlos Santana – Well All Right. Now, I’m not one to start rumours, but there is a lick on this track which is uncannily representative of Peter Green’s playing at that time. The eq settings on the original are different at the point in the track and everything. 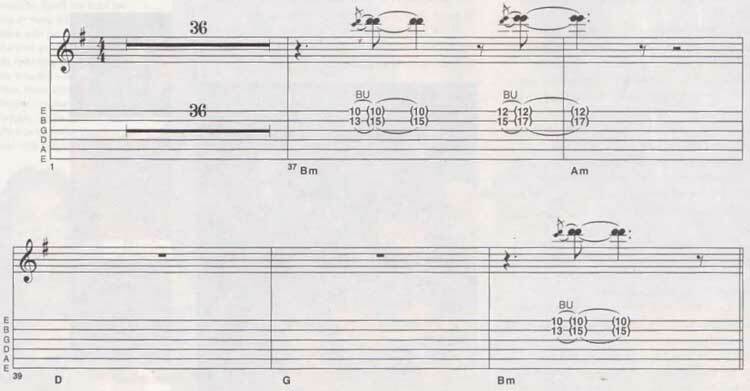 It’s unlikely that Carlos momentarily slipped ‘out of character’ for just these few notes and if it had been an overdub, surely they would have made the sound of the guitar ‘fit’ the rest of the track? It is pretty well known that Carlos and Peter were chums – Santana having covered ‘Black Magic Woman’, of course. I’ll let the jury decide -is it Peter or not? 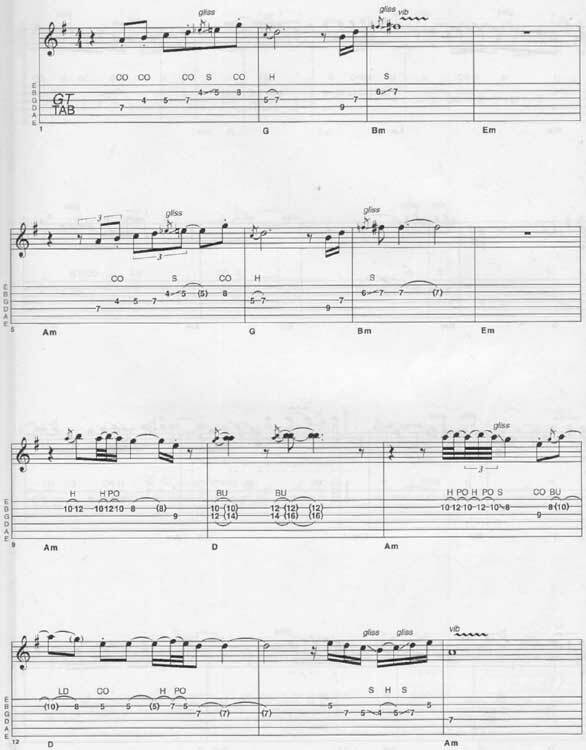 It’s just a part of Carlos Santana Samba Pa Ti guitar tab and sheet. © 2012 - 2019 TabsClub Powered by TabsClub 41 queries in 0.274 seconds.